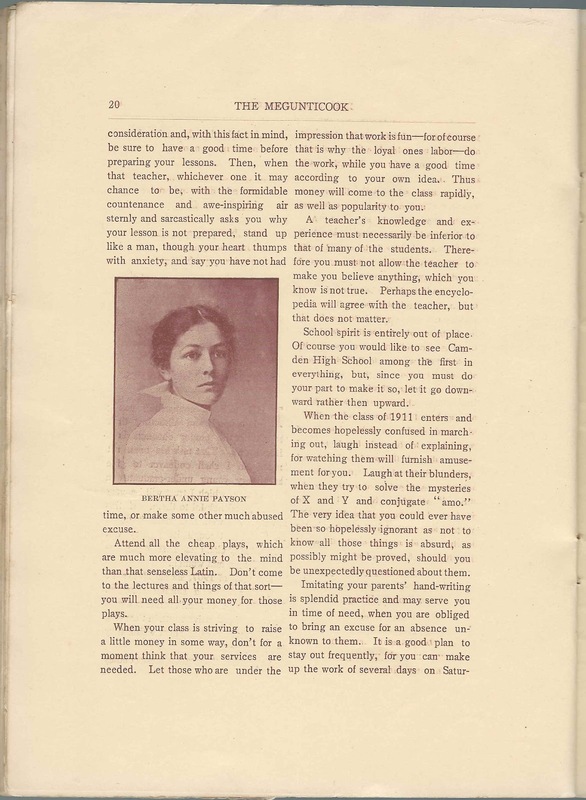 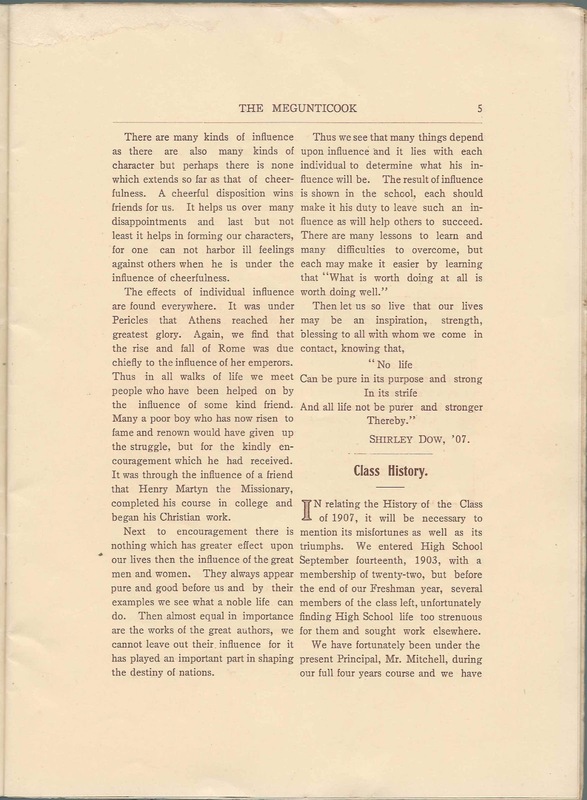 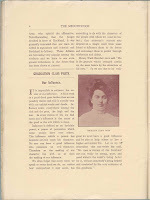 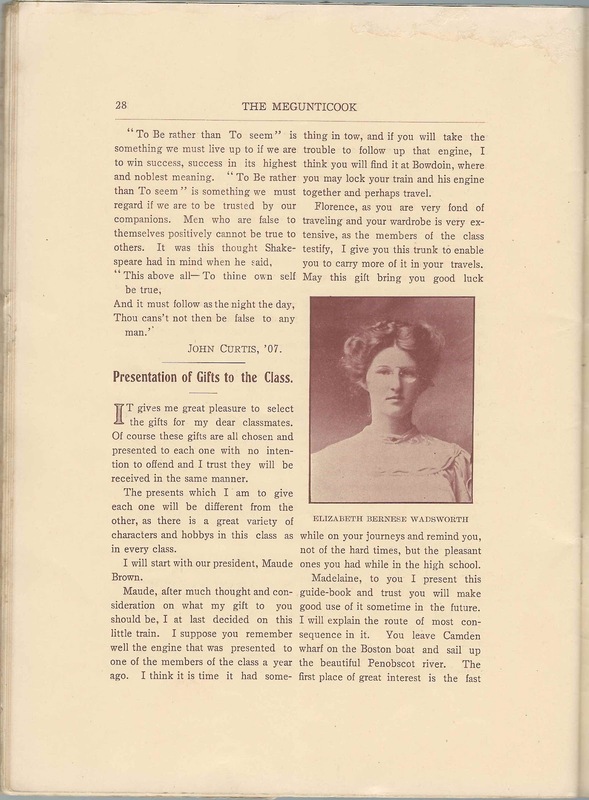 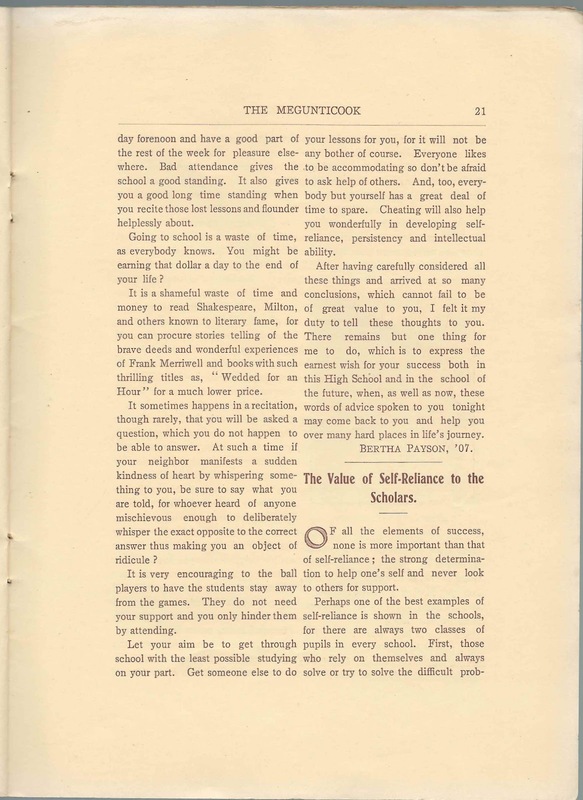 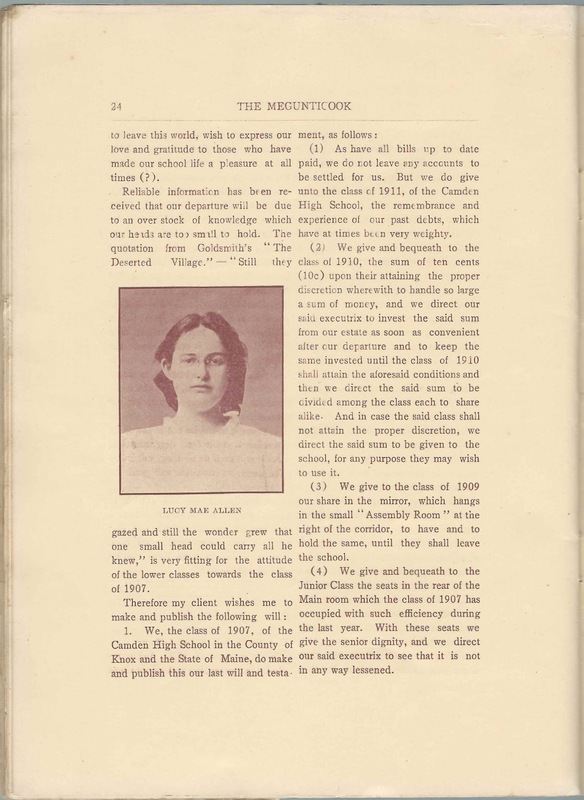 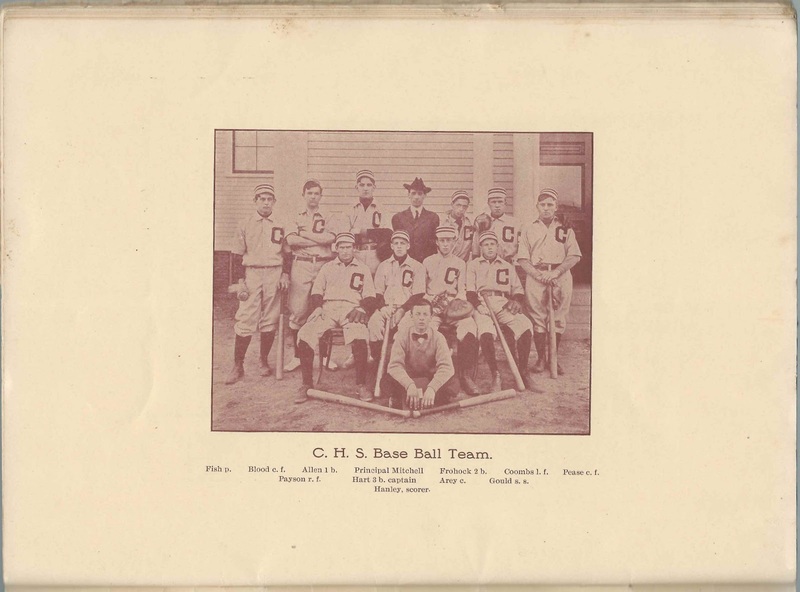 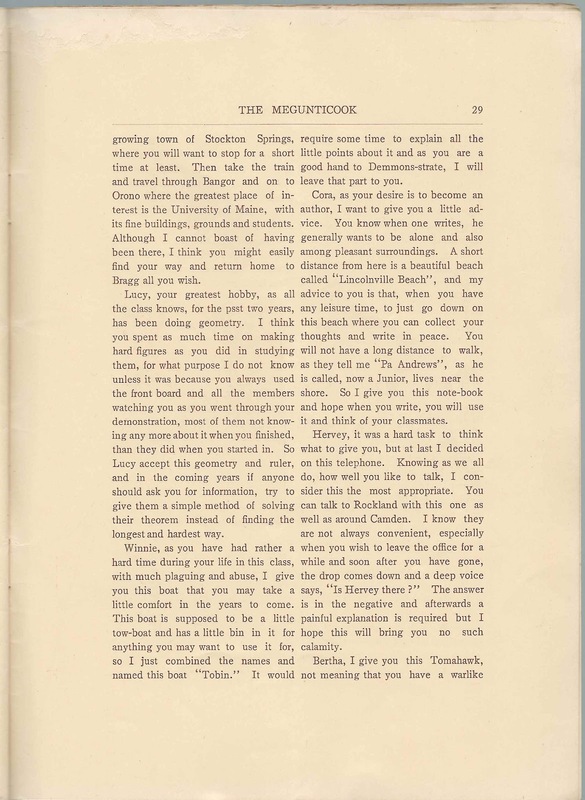 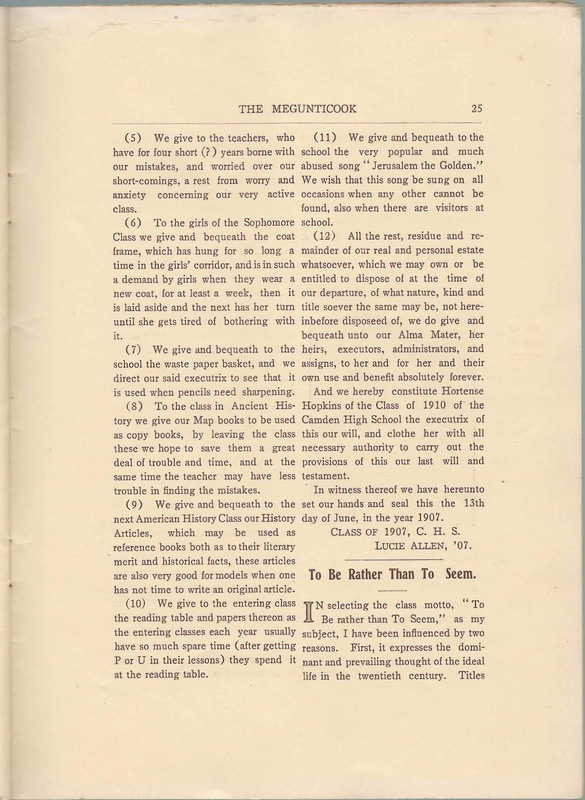 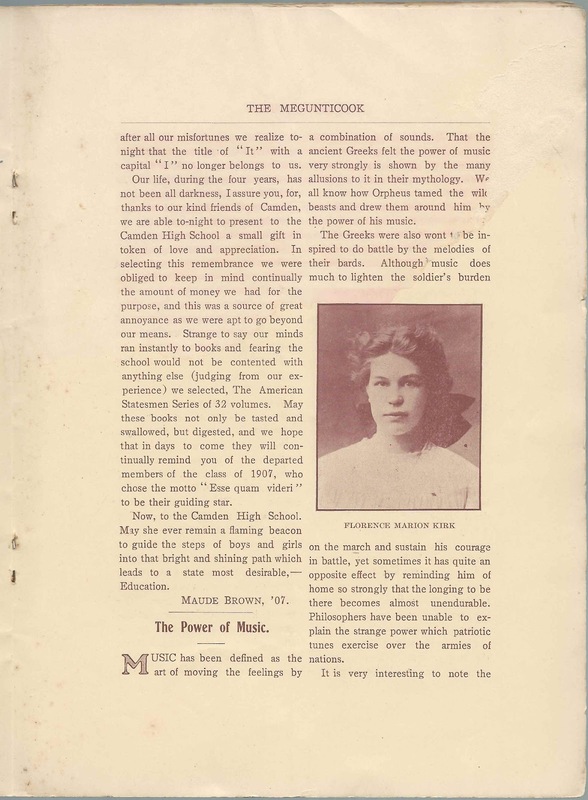 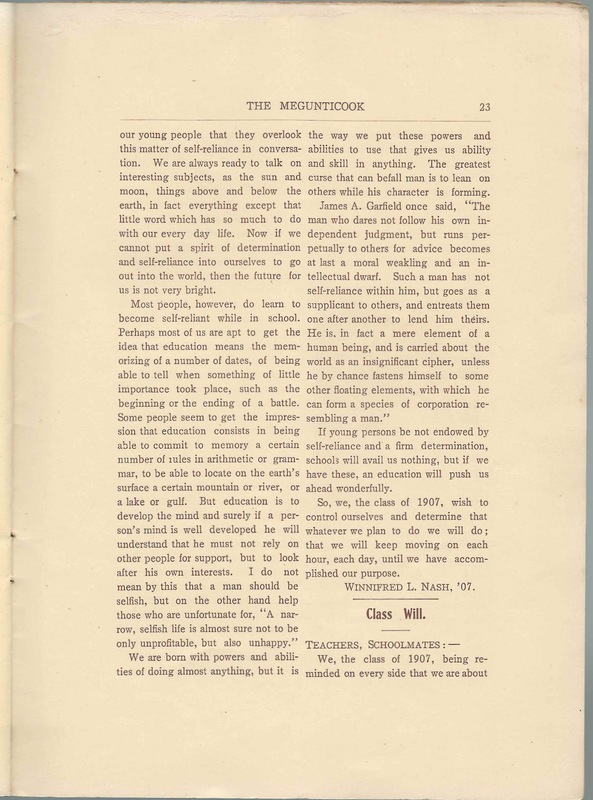 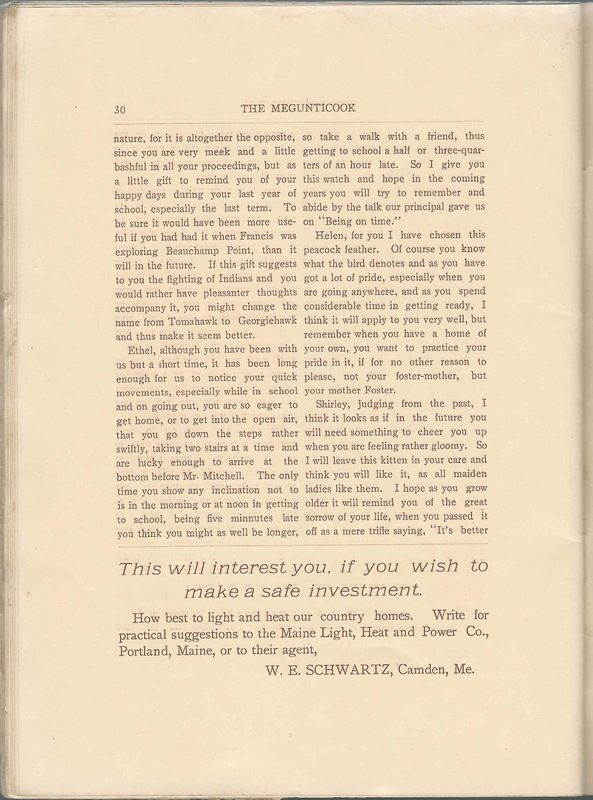 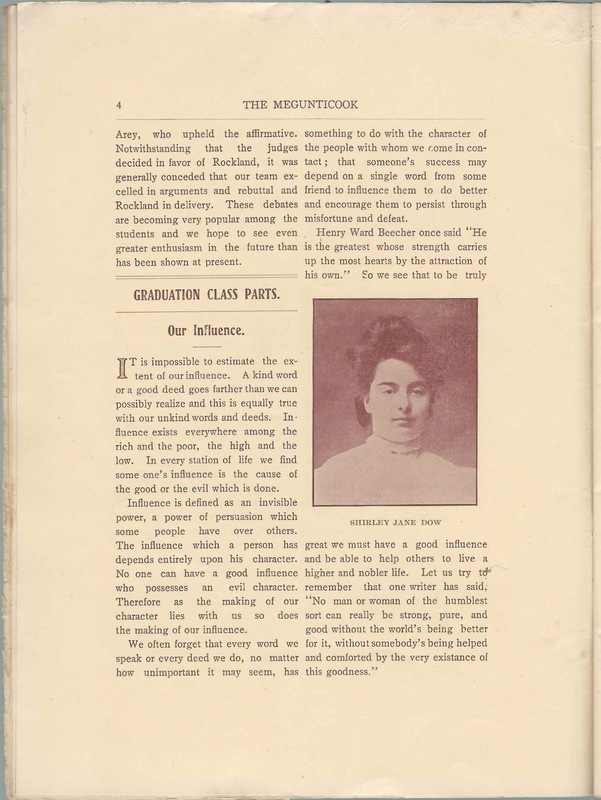 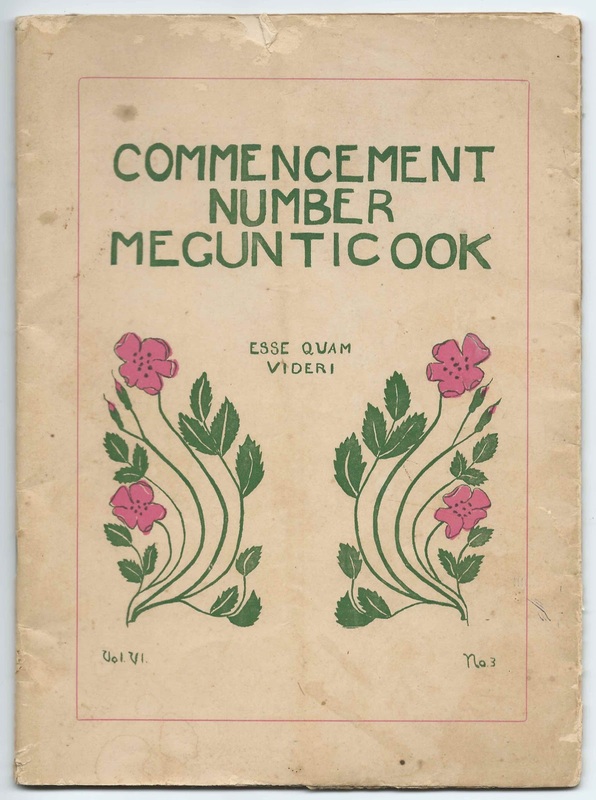 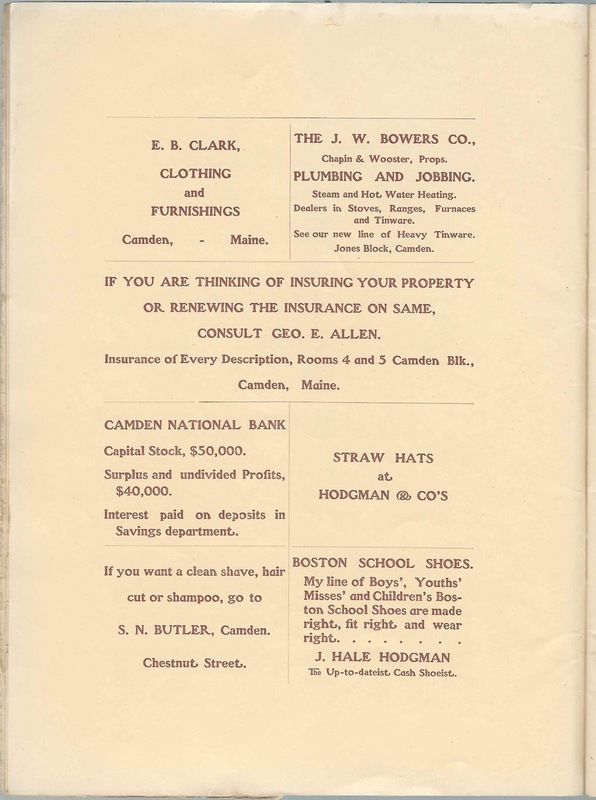 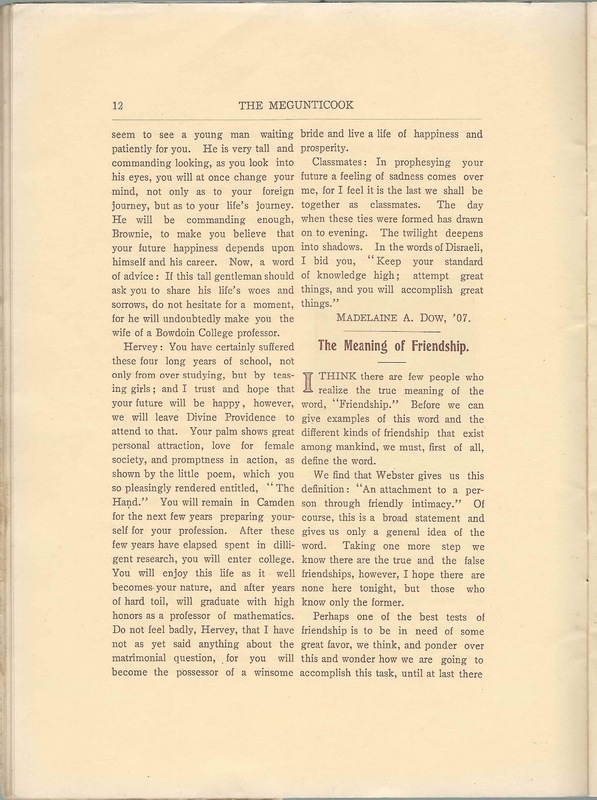 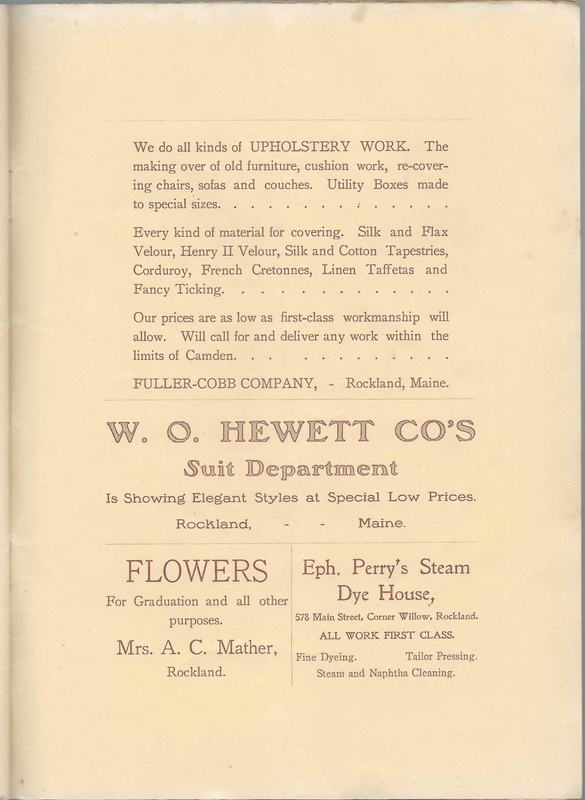 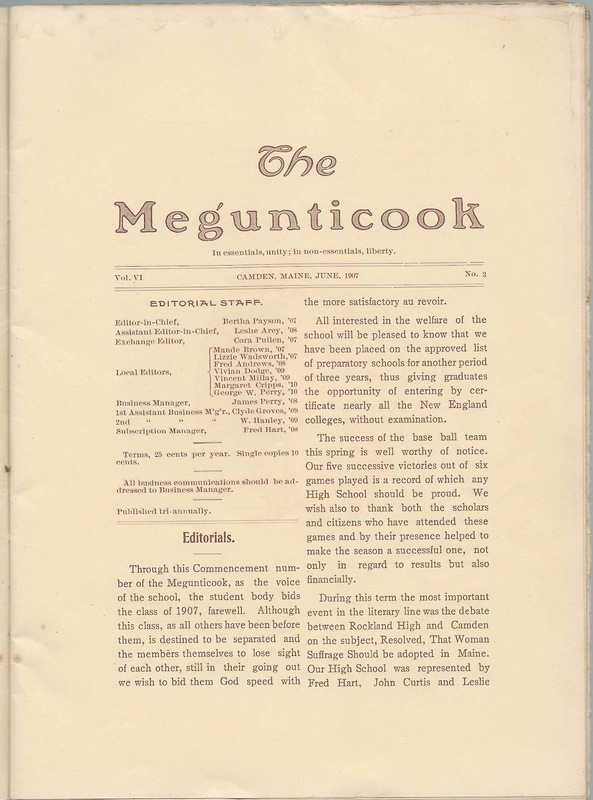 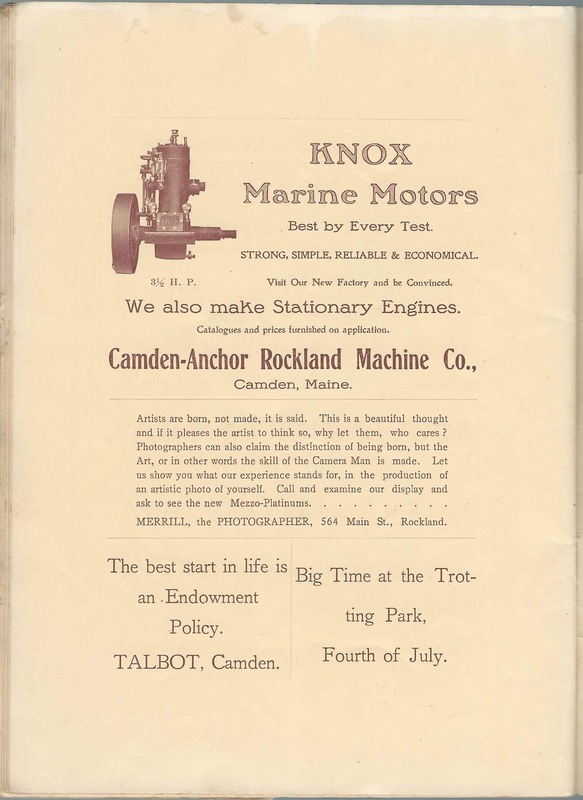 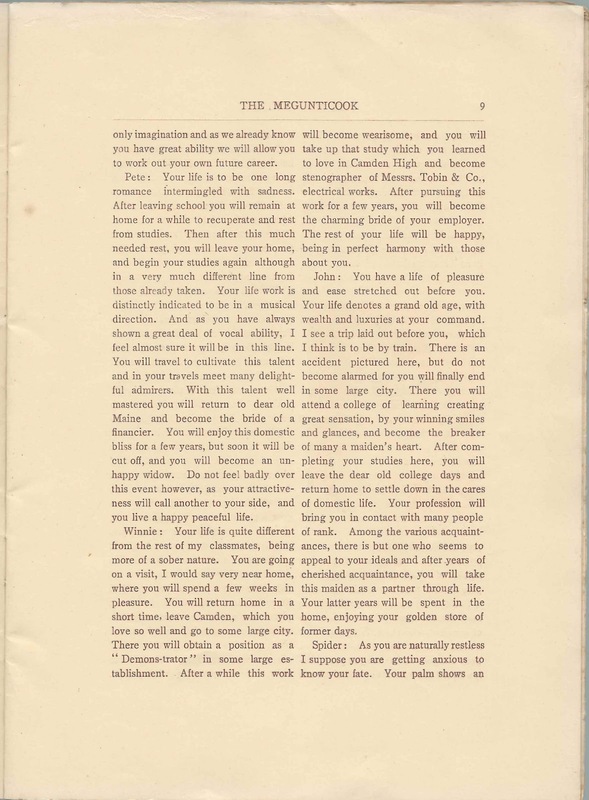 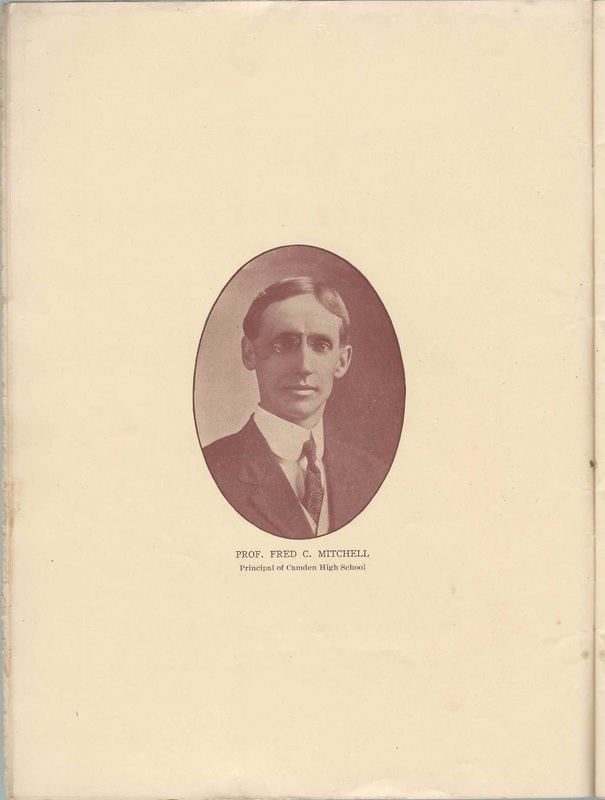 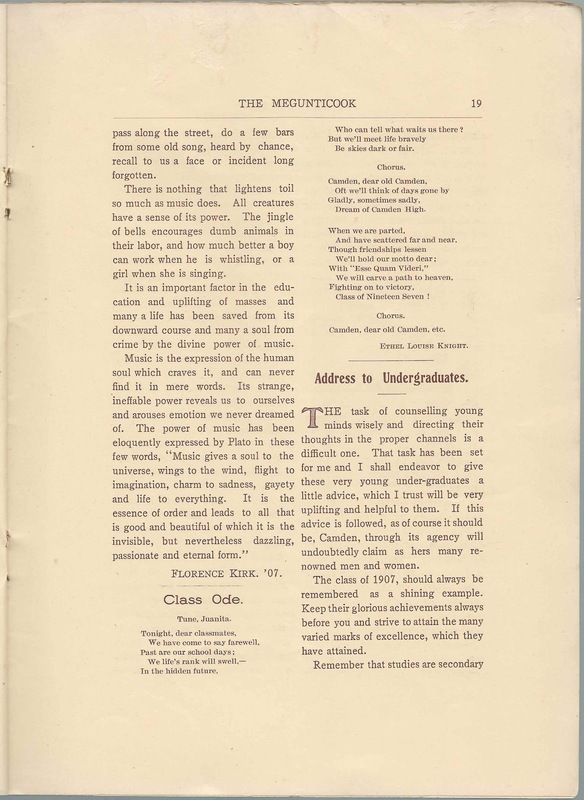 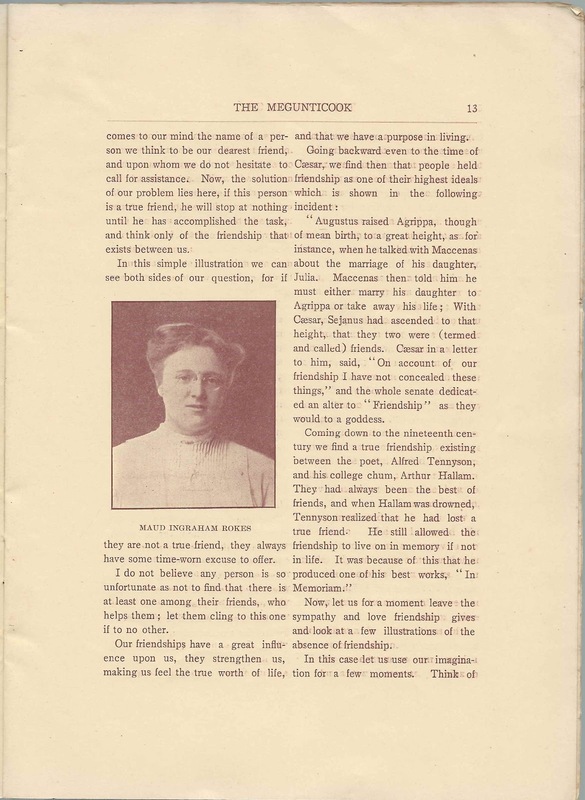 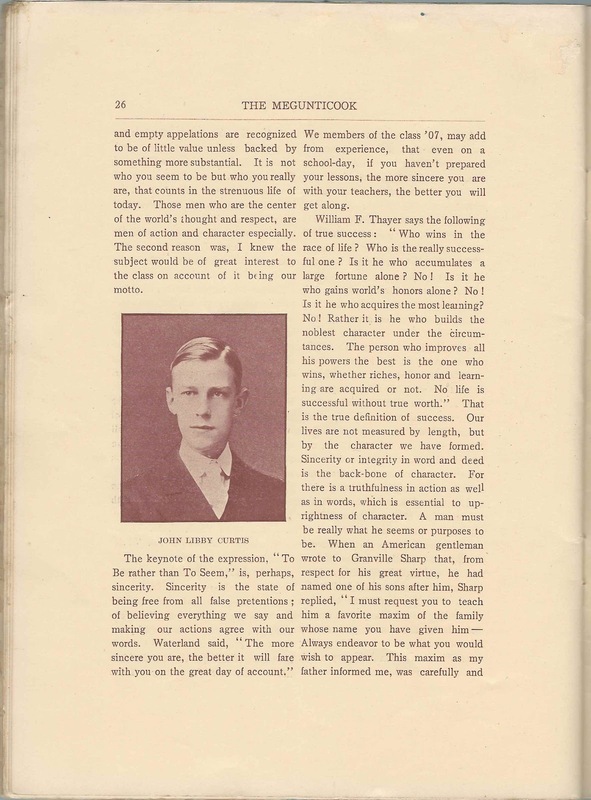 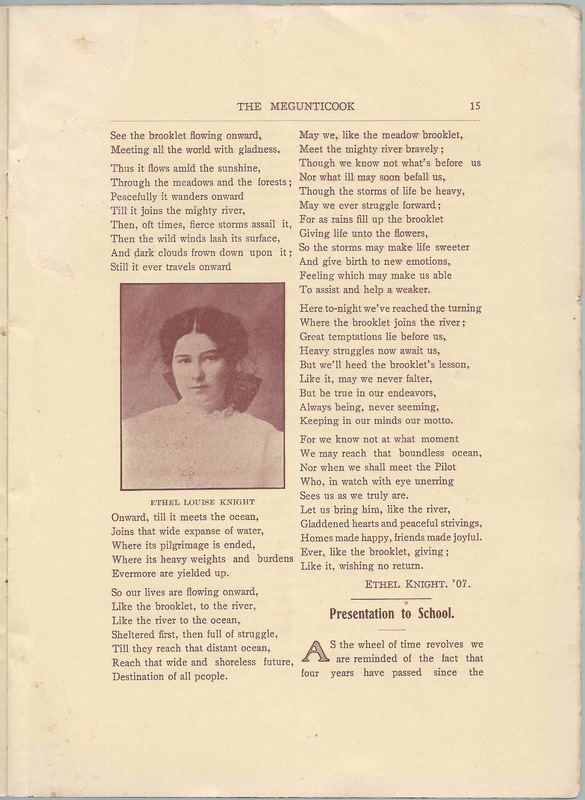 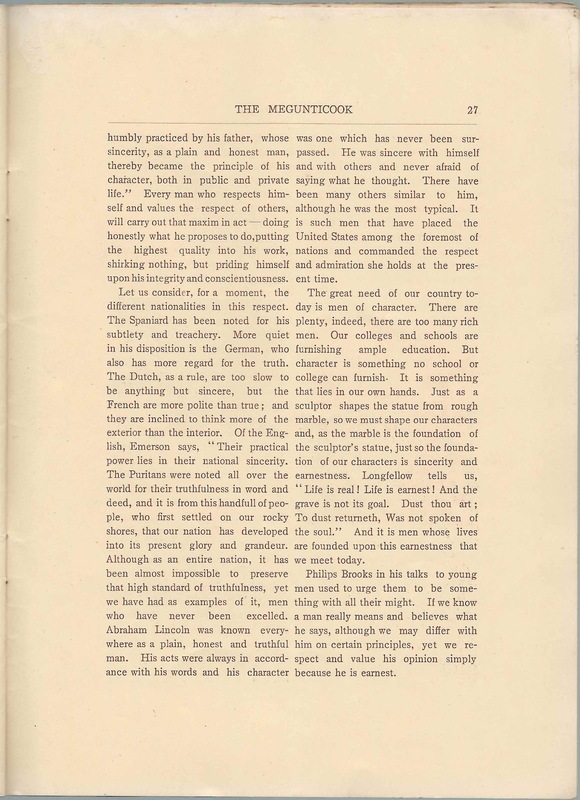 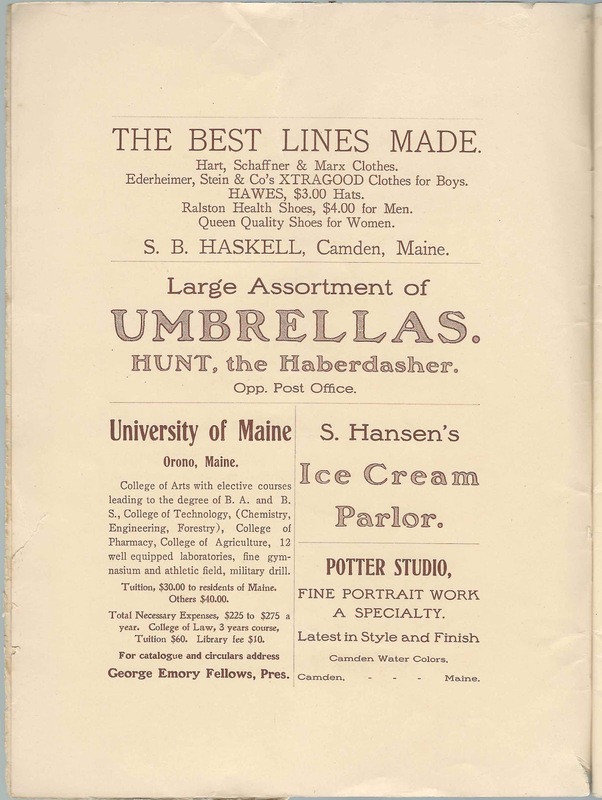 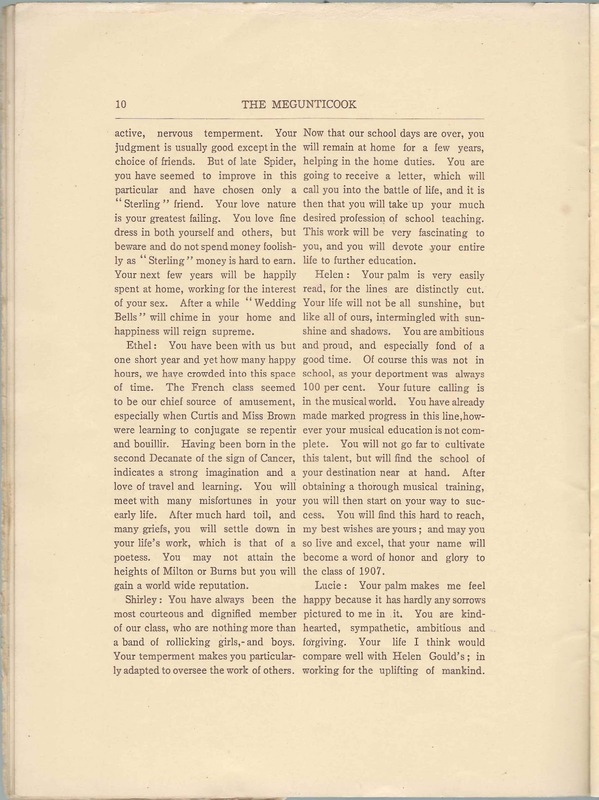 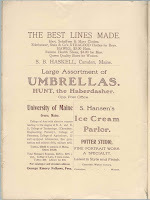 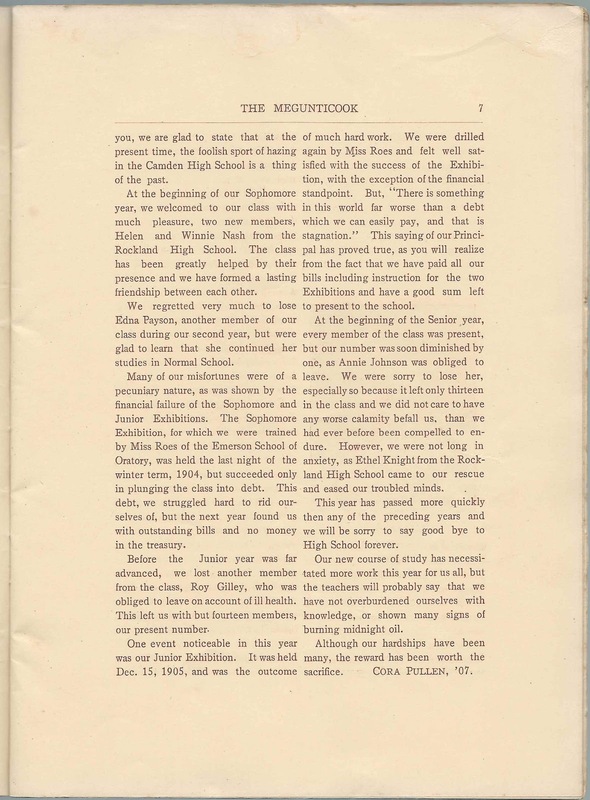 1907 commencement issue of the "Megunticook" of Camden High School at Camden, Maine. 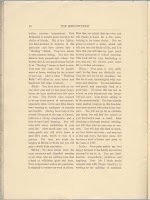 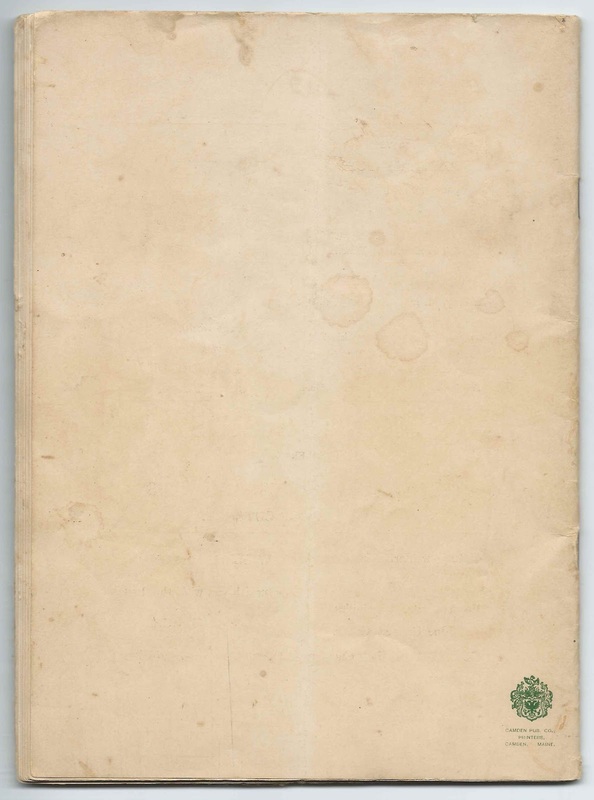 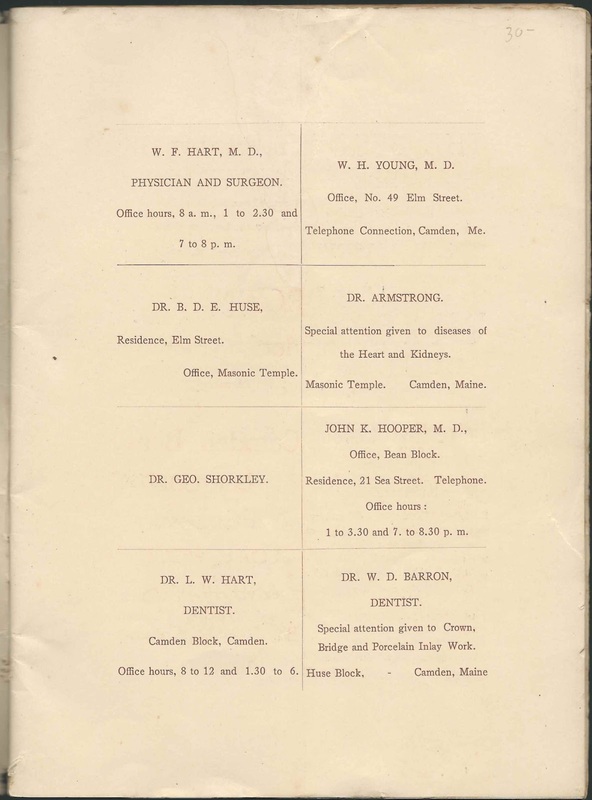 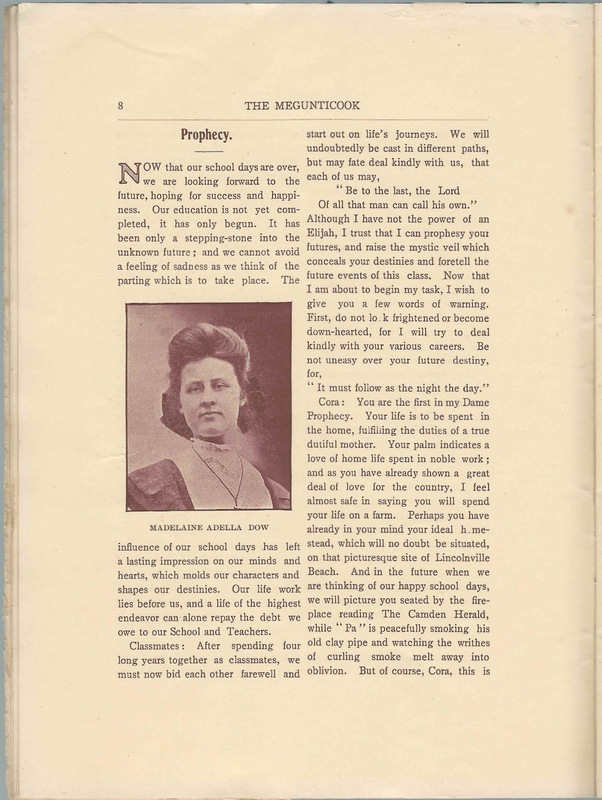 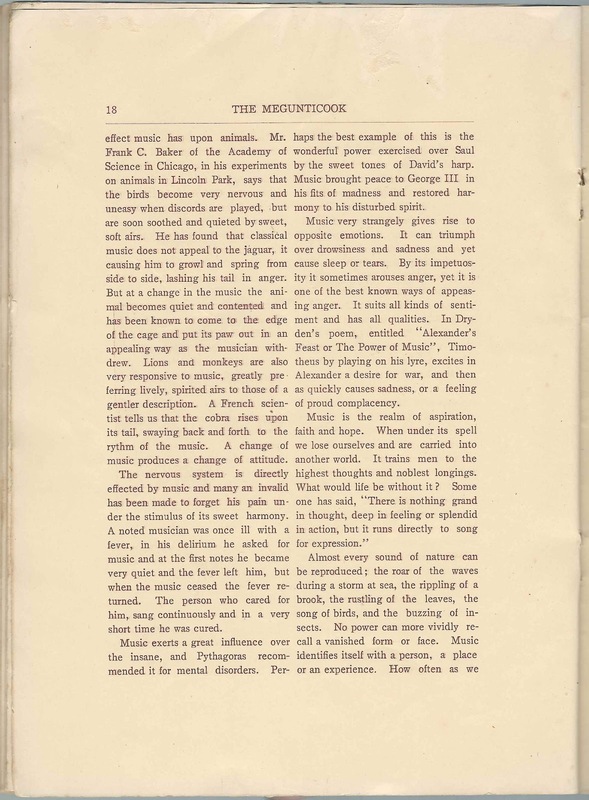 Volume VI, Number 3. 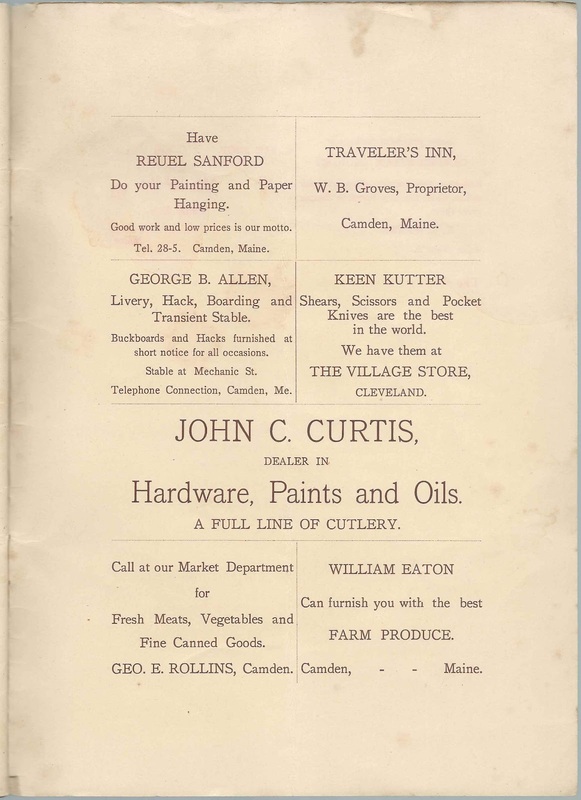 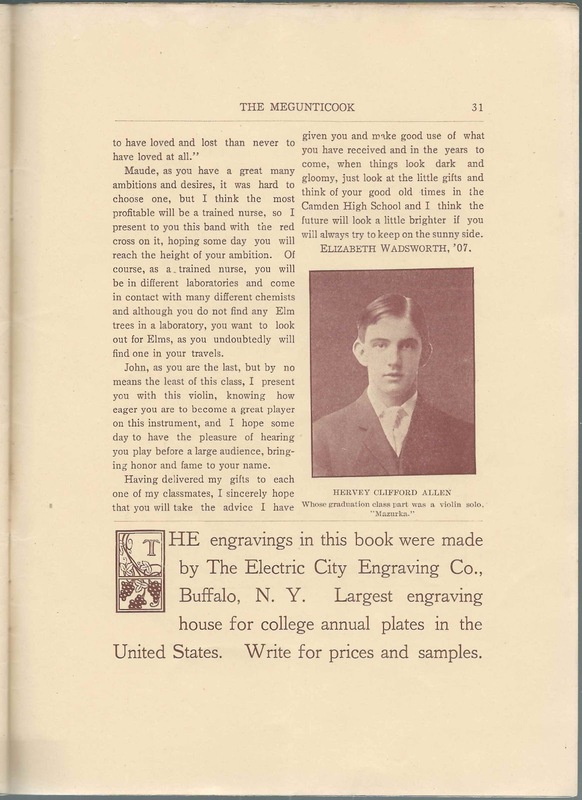 Approximately 9-1/4" by 7", with 31 numbered pages, plus several pages of advertising at the front and back. 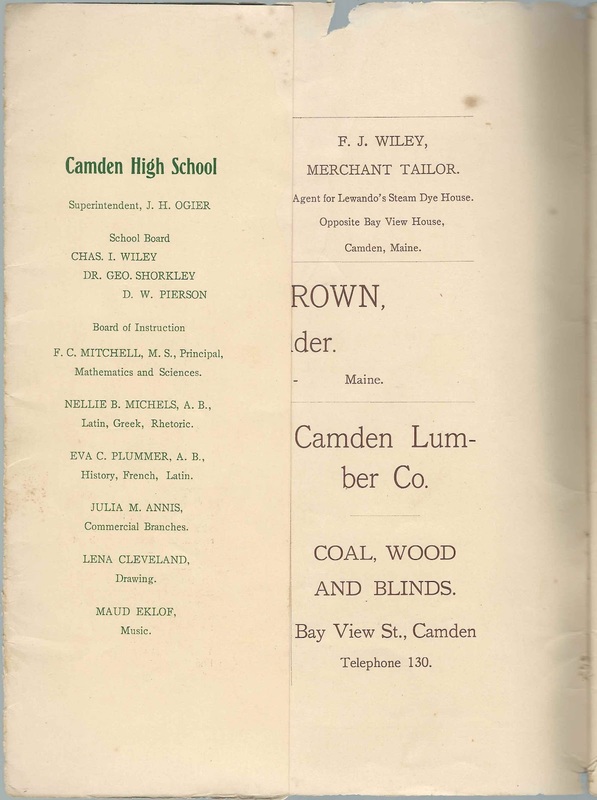 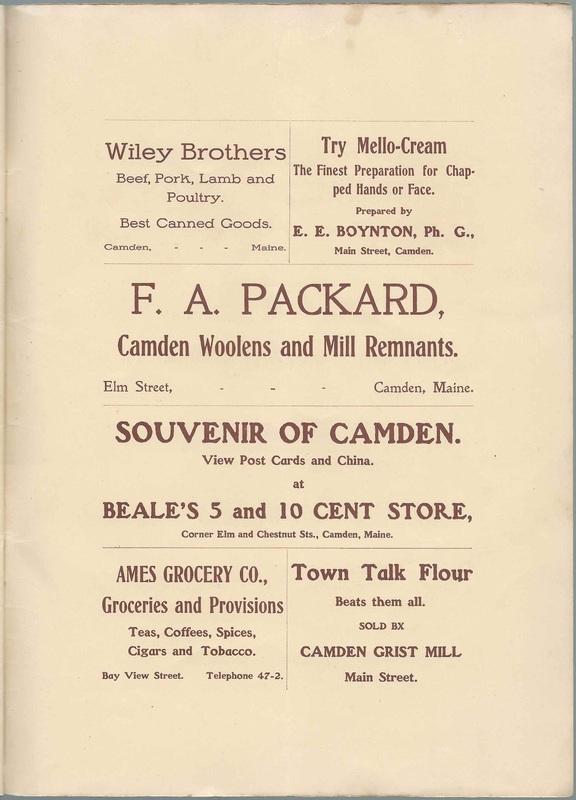 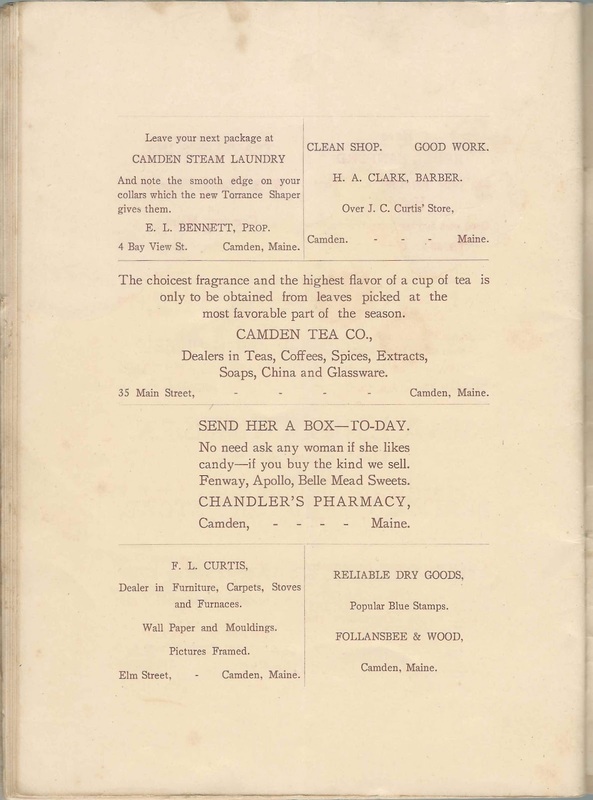 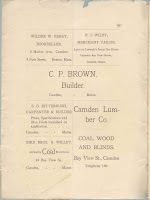 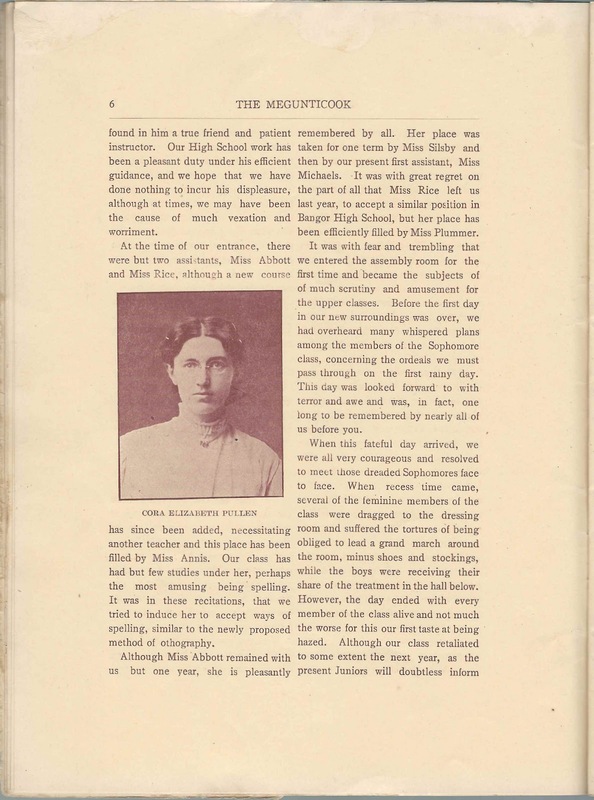 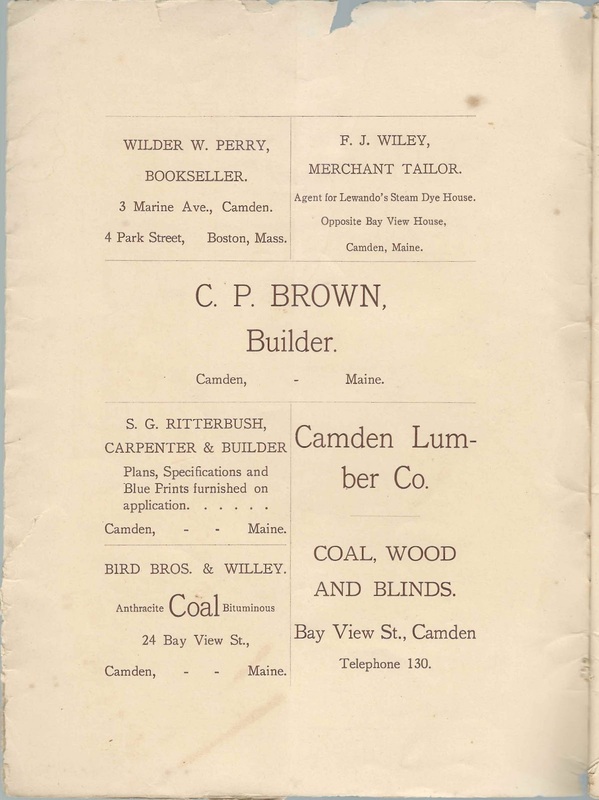 Printed by the Camden Publishing Company. 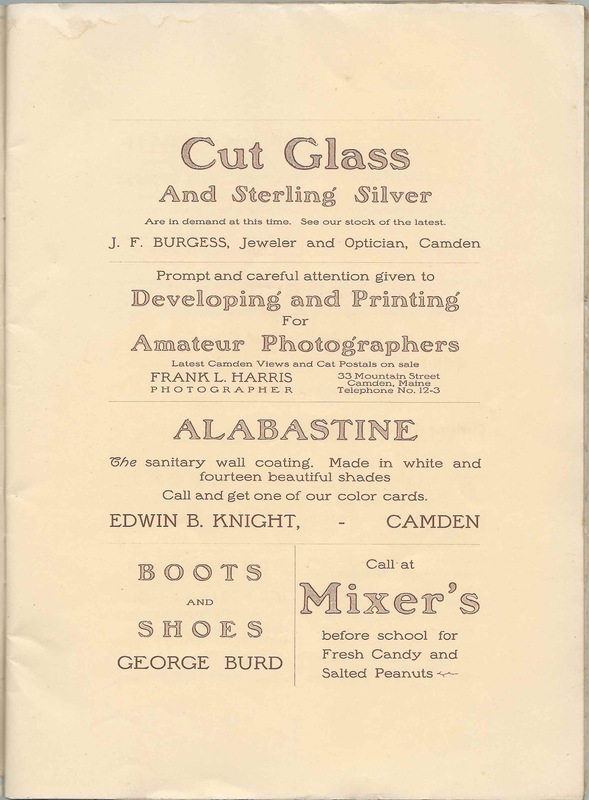 An alphabetical list of the names in the issue appear at the end of this post. 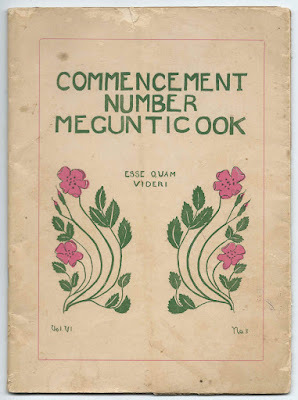 Please leave a comment if you have information on any of the graduates. 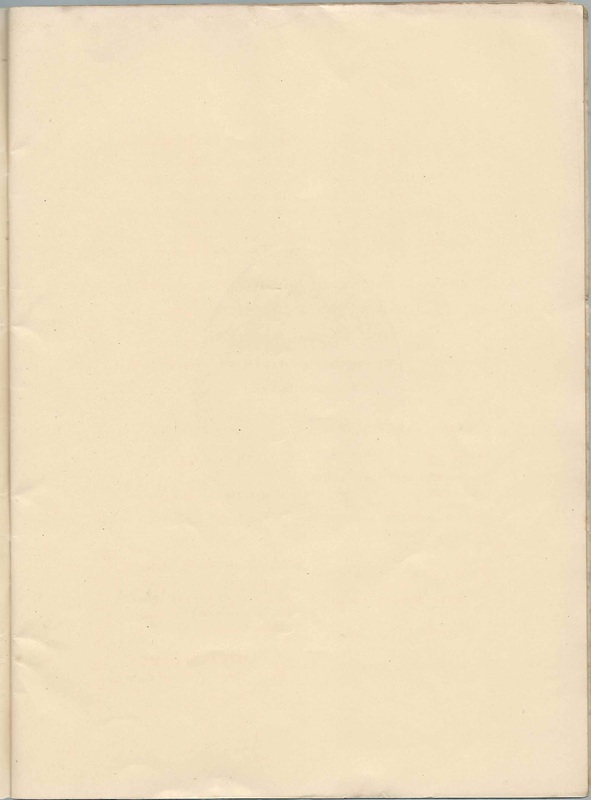 Click on the first image, and it will appear enlarged in a new window. 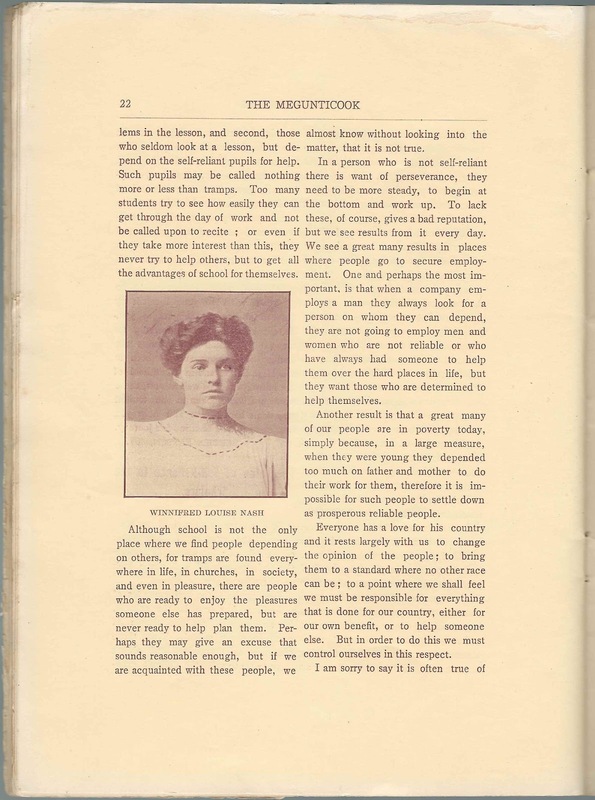 You'll note all of the images shown as thumbnails at the bottom edge; if you leave your cursor in place, you can easily click through the entire issue. 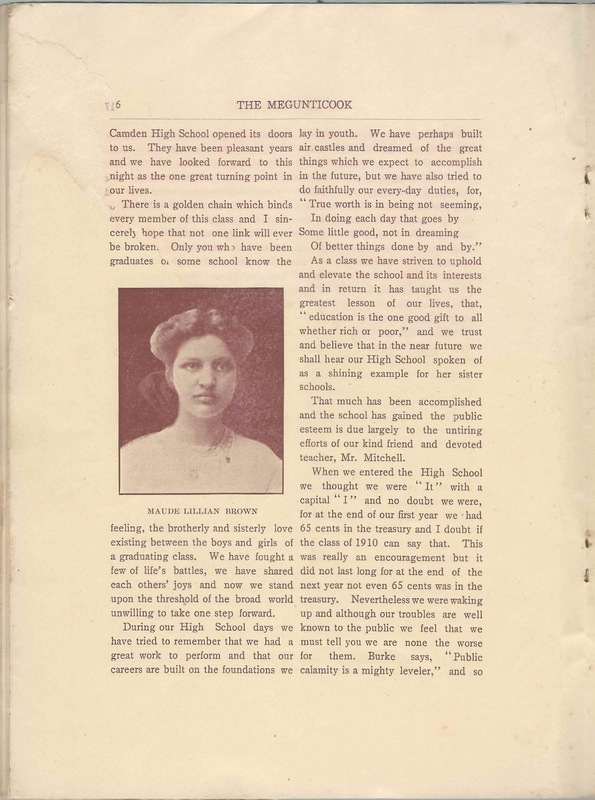 Lucy May Allen, '07; graduation part Class Will; photograph. 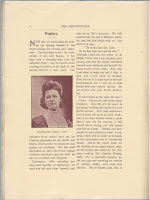 In another place her name was spelled as Lucie. 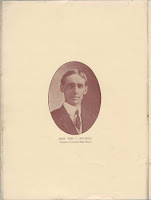 Hervey Clifford Allen, '07; graduation part: violin solo of "Mazurka"
Fred Andrews, '08, one of the Local Editors of the "Megunticook"
Leslie Arey, '08, Assistant Editor-in-Chief of the "Megunticook"; represented the school in a debate: "Resolved, That Woman Suffrage Should be adopted in Maine"
Margaret Cripps, '10, one of the Local Editors of the "Megunticook"
Vivian Dodge, '09, one of the Local Editors of the "Megunticook"
Clyde Groves, '09, 1st Assistant Business Manager of the "Megunticook"
W. Hanley, '09, 2nd Assistant Business Manager of the "Megunticook"
Fred Hart, Subscription Manager of the "Megunticook"; represented the school in a debate: "Resolved, That Woman Suffrage Should be adopted in Maine"
Nellie B. Michels, A.B., instructor of Latin, Greek and Rhetoric; spelled Michaels in another place. 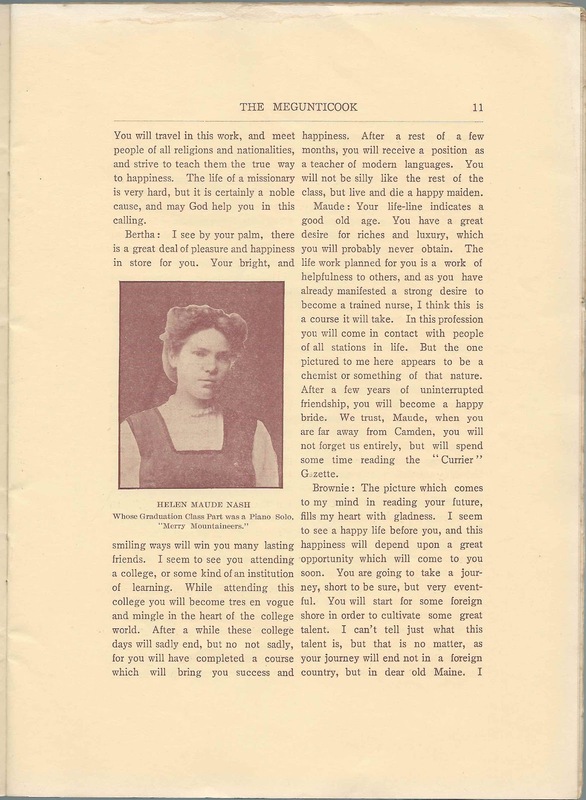 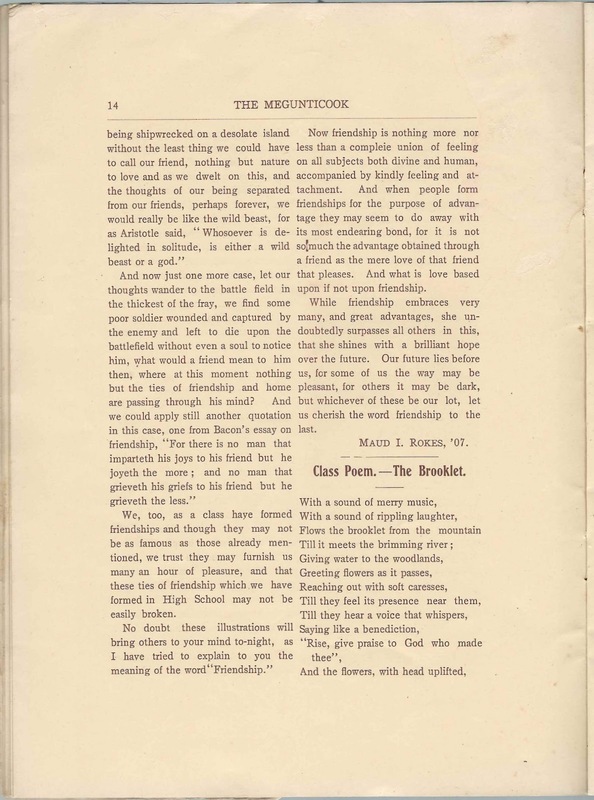 Vincent Millay, '09, one of the Local Editors of the "Megunticook"
Winnifred Louise Nash, transfer to the class from Rockland High School; graduation part essay "The Value of Self-Reliance to the Scholars"
Bertha Payson, '07, Editor-in-Chief of the "Megunticook"
George W. Perry, '10, one of the Local Editors of the "Megunticook"
James Perry, '08, Business Manager of the "Megunticook"